Work 2017 50 minutes Following on from Compact, Jann Gallois questions our capacity to live together in peace in Quintette. Whether it is within a group or on the scale of nations, union and separation seem to obey an unending cycle. 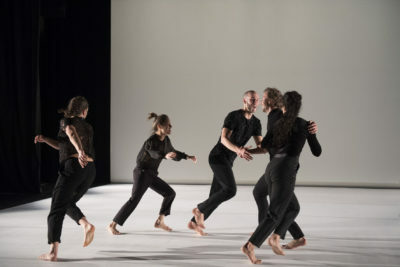 Ruled by a score of extreme precision, Jann crosses choreographic and mathematical research with the goal of exploring the mechanism of union and disunion with five bodies. She does this because dance for Jann Gallois is above all seen music, a song of visual and graphic bodies.